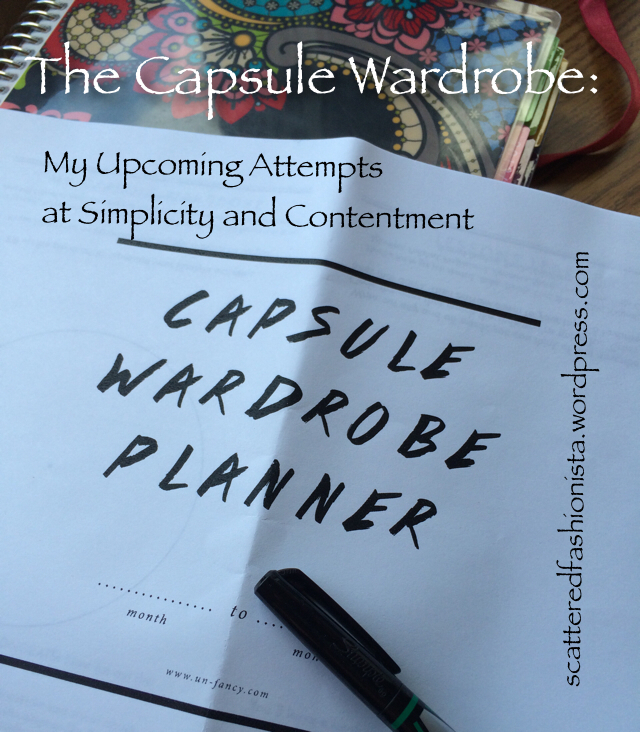 Last week I was introduced to the idea of the Capsule Wardrobe, which Caroline blogs about here. I’ll admit, the idea is a little intimidating, especially as Caroline’s magic number for her wardrobe is just 37 pieces. I do pretty well with this number until you calculate in shoes, cardigans, and jackets. Which she does. I think I have 37 items in those three categories alone. Back in the day, maybe sometime in the early nineties, I heard this concept referred to as “core wardrobing,” so it’s not new. However, Caroline offers some tips on her blog to help us limit the size of that wardrobe and at the same time give us countless combinations from those 37 items. According to her statistics, you might wear the same outfit (that’s outfit, not item) twice per season. Now, that is seriously exciting! While I’ve only just begun planning out my fall wardrobe, I wanted to share this concept with you and let you know that you can download Caroline’s Wardrobe Planner here. I’d love to hear your thoughts! I love this idea. I used to have a very small wardrobe. Now that I have a career my wardrobe has expanded…almost too much. I have church clothes, dress clothes, work clothes, casual clothes, exercise clothes, etc. I bought a hanging rack for pants last week, and the kit included 18 hangers. I thought that would be plenty because how many pants could I possibly have? Well, when I included capri’s I was quite a few over the limit. I’ve been very good at getting rid of clothes I don’t wear or that don’t fit…but it’s so hard to reduce when I wear pretty much everything in my wardrobe! I wish you luck with this endeavor. You know, it’s pretty overwhelming at first! But now that I’ve done the initial purge, I’m excited about taking my time and purchasing quality pieces that I think will cross over from season to season and year to year. The stuff that I’m not sure about or doesn’t fit is going in a bin and I’ll reevaluate next summer.